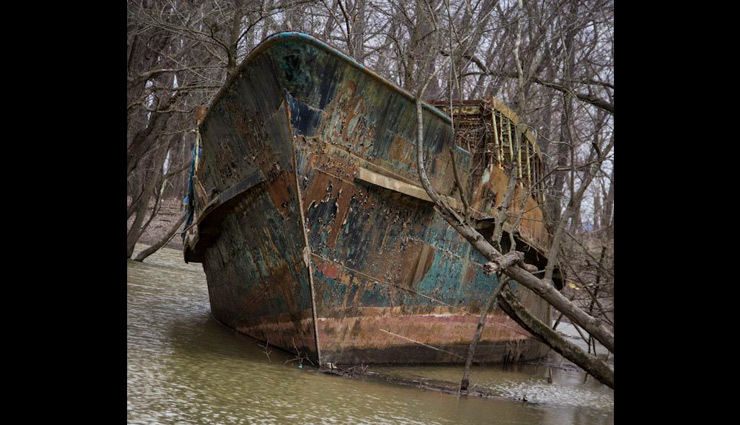 It's not every day you find a century-old ghost ship rusting along the river but these kayakers discovered just that whilst out and about on the Ohio River. 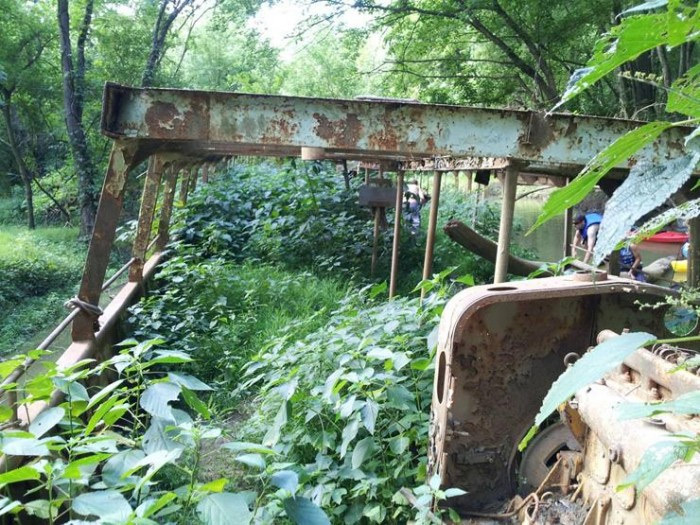 But it wasn't just some old rusting tub floating at the back of someone's property, this one had a stunning story to tell, a story that will leave you speechless! Hearing that an abandoned ship may be there, a group of kayakers headed out, making sure to keep their eyes peeled for anything out of the ordinary.About 25 miles out of Cincinnati, the ship was lurking in the waters waiting to be rediscovered and rusting up in the meantime. 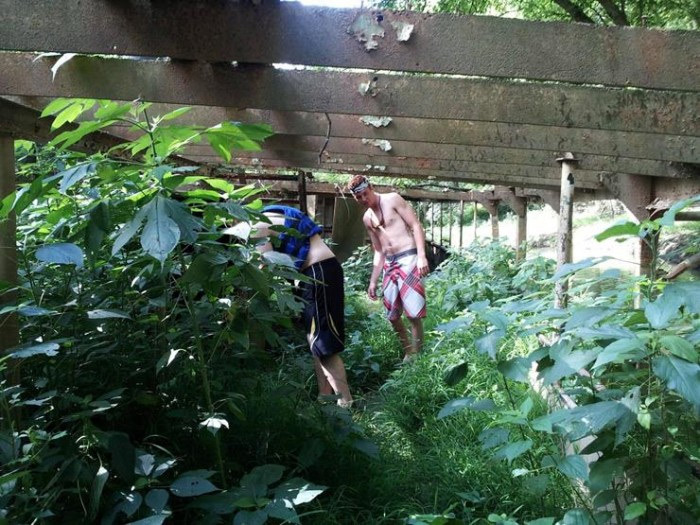 Covered in weeds and plant life, it had become tangled in the trees that were overhanging it.As such, reaching the ship became a bit of a problem and so the kayaks were dragged on land and the adventurers hiked across a field and hopped a fence to get onto the boat. The abandoned ship then offered up sights of its rusted and silent interior that are somewhat akin to a horror movie. Time had not been kind to the vessel as it had clearly deteriorated over time. Covered in rust and large, delapitaded holes spotting the hull, the old vehicle was clearly not in good shape but that belied a great and far-reaching history. It turns out the ship had a pretty extensive and interesting history and was built in 1902 in Delaware because railroad executive, J. Rogers Maxwell, had commissioned the 186-foot vessel as a luxury yacht. It was called The Celt. Its days of 'luxury' were obviously long behind it, so what happened to let it get into this sorry state of affairs? 15 years later, the USA entered WWI and the navy wanted small boats that could outmanoeuvre German U-boats and The Celt was just such a vessel. Nimble and flighty, it was brought into the ranks and retrofitted to deal with its new, more hardy task going from luxury to war.Attaching machine guns and renaming it the USS Sachem, the navy put it to use as a coastal patrol vessel. Inventor Thomas Edison even spent some time aboard the ship whilst he was conducting experiments in New York Harbor.After the war the ship was returned to its original owner who sold it on to a banker in Philadelphia and then it was bought by Captain Jacob Martin of Brooklyn in 1932. Converting it into a chartered fishing vessel, Martin would charge passengers $2 a time to board the vessel for fishing expeditions. By 1941, the United States were again involved in another world war and once again the navy made use of the boat renaming it USS Phenakite, it was used to patrol the waters of the Florida Keys. The vessel did not see action but it was once again involved in a global conflict and protecting its nation's waters.Returned to Martin after the war, he sold it on to a sightseeing company operating out of New York City where tourists would use it right up until it was retired in 1980. Over 40 years of ferrying sightseers had taken its toll but the boat was still in good operating order. Robert Miller from Cincinnati bought the ship for $7,500 and wanted to use it for a trip to the Midwest but it also attracted the attention of a representative of the recording artist Madonna. As such, the boat appeared in the 'Papa Don't Preach' music video and became part of the iconography of the age. Madonna was one of the biggest artists of the time and built her career off the back of such hits.This was the MTV age and music videoes were incredibly important to the success of a song so the visuals had to be justr right and the boat was a part of this process. After filming, Miller took the boat on an epic journey from New York through the Great Lakes and the Mississippi River. Finally, it came to rest in Northern Kentucky, on Miller’s property. That was back in 1986, and it hasn’t moved since. Although it would seem that its illustrious career had come to an ignominious end, the current owner claims to have every intention of restoring it and using it for pleasure, leisure and maybe, once again, to turn a profit. Especially given its history.